The first series that captivated my imagination was The Chronicles of Narnia. The idea of having a secret world —imaginary or otherwise—was so appealing I had to create my own as soon as possible. Fast forward a couple of decades, and I have gone through the dark realms of Stephen King, to the lighthearted girl power of Sailor Moon. I've fought monsters on Zelda, and become a die-hard Roswell fan. I've lost my memories with Jason Bourne, and I've lived a thousand lives alongside vampires, immortals, and fairies. Magic and science blend into the tales I bring to life, and I am constantly striving to capture the essence of the great storytellers from my past. 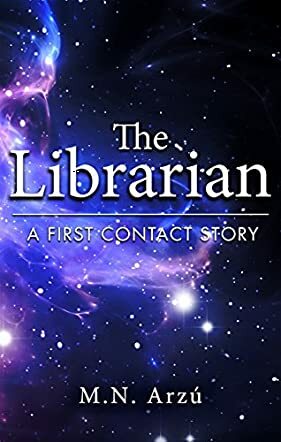 The Librarian: A First Contact Story is a short sci-fi tale told by M.N. Arzú. Jane Logan is deciding on an evening snack while she awaits the return of her husband, Nick, who went hiking alone for the day. There’s a knock on her door, but instead of her husband, Jane is greeted by a very imposing US General Mitchell who whisks her away to his base. He tells her they’re holding an impostor who is impersonating Nick. Nothing makes any sense, and it makes even less sense when Jane arrives and meets the man who looks like Nick, but his image on the video monitor shows him made entirely of light, an alien being. And, he's radioactive. Jane wants to flee, but the alien insists on talking to her and the General insists that she listen. But where is Nick? I thought The Librarian was a fantastic story with a perfect ending. Arzú’s writing is economical – nothing is wasted and the narrative moves along at a brisk pace. Besides being a fine piece of science fiction, The Librarian is also a very sweet love story. There is not much time to develop Nick and Jane’s relationship and yet we learn everything we need to know. Besides not showing up on video, the alien’s voice also doesn’t show up on recording devices, so a young army private is assigned to type all his words. Private Connors is an enjoyable addition to the story. From start to finish, I loved this book. Recommended for sci-fi fans and romantics alike.